A kitchen island brings functionality and visual beauty to your kitchen with ease. Here are the best ideas for designing kitchen islands with natural stone. A kitchen island is the center of your space. It functions as a storage unit, extra counter space, a conversation area, a workspace and more. If you’re looking to add a multi-functional island to your kitchen, natural stone is the perfect material to choose. Different stones highlight different design aspects of your kitchen. Marble brings in an unmistakable elegance and European luxury, while granite brings in a feeling of depth and strength. Natural stone is eco-friendly, durable, and visually breathtaking. Here is why you should design your kitchen island with natural stone. Before designing your island, you should make a list of all the reasons you want one in your kitchen. Is the purpose to serve as a sink and extra counter space, such as seen in our Coral Gables kitchen makeover (pictured above)? Or do you desire extra storage space or a bar-top for eating? Narrowing down the purpose of your island will give you a better idea of the side and structure of your design. Marble has long been used because of its splendor and aristocratic appearance. If you’re looking to create a focal piece in your kitchen, marble is the way to go. With its creamy white base and thick, unmistakable veining, marble has an unmatched beauty. Marble is also cost-effective, durable, resistant to cracking, heat-resistant, and will last a lifetime with proper care. It is also an easy way to add drama to your kitchen without making bigger changes, such as refinishing cabinets or buying new appliances. Natural stone is perfect for a kitchen island if you’re looking to add a sink to the countertop. Granite, for example, is non-porous, meaning it is a sanitary choice to have for a sink since you will likely be washing raw foods or dirty hands. Polished granite, when properly sealed, prevents the growth of mold or bacteria. Granite countertops will not fade in color, are heat-resistant, are non-porous, and increase the value of your home. Many kitchen islands are now created with an overhang that acts as a seating area for stools or bar-top benches. 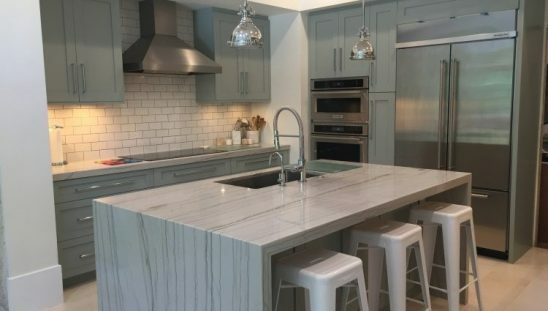 Quartz is a fantastic option for a natural stone kitchen island since it is stain resistant, easy to clean, non-porous, and extremely hygienic. This resistance to stains and scratches makes it perfect for entertaining company in your kitchen. Quartz is also impact resistant, meaning it is durable and absorbs powerful shocks without cracking. Whether you’re designing your home to be country chic or sleek and modern, natural stone has a wide variety of styles and colors to choose from. By choosing natural stone for your kitchen island you will be bringing luxury and elegance into your new kitchen space. 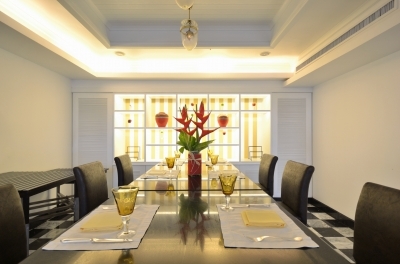 To enhance the value of special social occasions and everyday mealtimes, use these ideas to create your very own contemporary dining room that is as fabulous as the memories you will make in it. Marble is known for its luxurious appeal, durability and richly veined style. While marble is available in a variety of patterns and tones, selections such as Calacatta, Statuario, Naxos, White Himalaya, Bianco Carrara and Crema Marfil are popular choices for modern bathrooms. Marble can be used as bathroom counter tops, floors, shower walls, tub framing and walls….